“Film entries for the festival have come from as far away as Nova Scotia, Serbia, and Great Britain and as close as our own backdoor,” according to Jee, Chairman of the Festival Committee. Two locally produced works, First People – Kumeyaay, a documentary, and a comedy, Three Dead Husbands, are among the 22 films on the billing. “We are thrilled at the quality of the films selected and excited that many of the filmmakers plan to be on hand to represent their work,” Jee stated, adding that a full-schedule of events is planned for the four-day affair. It will all start with a gala Thursday evening, January 23, at the historic de Anza County Club where festival pass holders can rub elbows with the movie makers. Screenings of the films will take place Friday and Saturday at the Borrego Springs Performing Arts Center where pass-holders can vote for their favorite entry, Jee said. As an added attraction four-wheel-drive tours are being offered during the weekend to remote desert locations where scenes from some of the more than sixty movies shot in the area were filmed. Awards in the various categories and the coveted “People’s Choice Award”, all designed and prepared by local artists, will be presented Sunday afternoon at the newly re-opened and refurbished La Casa del Zorro. Also on tap for Sunday are free showings of movies produced by young filmmakers and the screening of Three Dead Husbands. 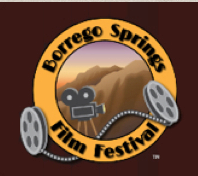 Information on film schedules and passes can be found at borregospringsfilmfestival.org or by calling (760) 748-6770. Deluxe Festival Passes are $100 (films, parties, location tour). Festival Passes (films and parties) are $35 ($50 after January 22). Film Location Desert Tours are $75. Individual tickets are $6. Festival Passes may be purchased online and at the Borrego Springs Chamber of Commerce, 786 Palm Canyon Drive. Individual Tickets may be purchased online or at the theater box office ½ hour before each screening. “We are urging people to purchase their tickets early as we have limited space in our theatre and for the desert tours,” according to Haddock, who added that the Chamber Office will be opened during the festival to assist moviegoers.